Lest We Forget | Việt Nam Cộng Hòa Muôn Đời Muôn Năm: Danh Dự. Tổ Quốc. Trách Nhiệm. Canadian soldier, physician, and poet in WWI. Source: In Flanders Fields and Other Poems, 1919. This is a legendary poem that is engraved in the hearts of every young Canadian child, recited by heart every year in the voice of every girl and boy in every Canadian elementary school, as they learn with gratitude the bravery and sacrifices of our soldiers and so many others around the world. As they learn the meaning of patriotism, pride, courage, valour, duty, and selflessness. 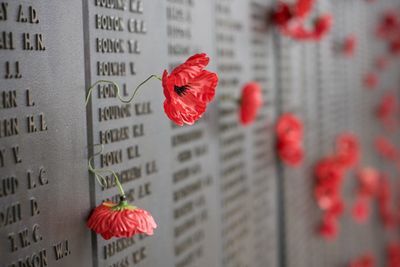 Once again today we remember our serving soldiers, our veterans, our honourable dead, all those who are fighting or have fought for our country, all those who have given up their lives so that we may have our Freedom.